Your peripheral vision makes up part of your overall field of vision, which is around 190 degrees. However, it’s far from perfect, and sometimes it causes us to see things which don’t really exist. We’ve found a cool way to prove this to you. The faces begin to become distorted, right? And the longer we look at the centre of the picture, the greater the distortion. Why does this happen? We’ll explain everything step by step. There’s an area of our retina which is called the yellow spot. It contains the largest number of receptors in the eyeball, thanks to which we can see a given area more clearly. Let’s call this area the main field of vision. It covers around 10% of the entire range of our vision, and shows what our eyes are directly focused on. 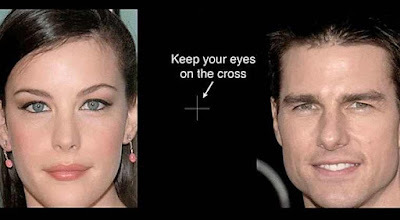 In this case, our main field of vision is empty; there’s just a dark area with a white cross. The brain tries to take information from other sources located outside of the main field — in this case, the alternating pictures on the left and right. These sources aren’t very ’reliable’, and the brain tries to combine them into one image. It’s also trying to process the photos in a very short period of time, since the images change very quickly. As a result, the ability to discern faces is lost, and the brain simply joins together different features from various faces into a single whole. Because of this, we end up seeing ’monsters’!